Avocet Hardware has received widespread industry praise for its #StayHomeSecure dark nights campaign. The campaign, was aimed at highlighting the annual rise in burglaries during the period following the clocks going back, while also positioning its ABS locks as the home security product for homeowners to put their trust in. The six-week campaign, which saw the return of Ollie the retired guard-dog, and the introduction of his former nemesis, Kat the burglar, saw Avocet reach over two million social media users in the UK. The Brighouse company gained over 1,100 new followers, and saw its Twitter posts alone retweeted over 4,000 times and liked 33,000 times. Astonishingly, the engagement rate of its Twitter activity far outstripped the global benchmark of less than 1% - averaging over 6% for the entire campaign. Meanwhile, it’s paid for social media activity also left the worldwide standard in its wake – with close to 1 in 5 of those who saw the weekly Ollie & Kat competition tweets either liking, sharing or commenting on them. One of Avocet’s key aims for the campaign was to engage with locksmiths, and demonstrate to them the benefits of using ABS locks. “We’ve been staggered by the response from the locksmiths, many of who we haven’t worked with before,” added Derrick. 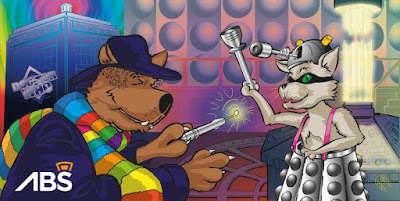 The artwork that was up for grabs featured Ollie – a guard dog forced into early retirement – and his former nemesis, Kat – an out-of-work cat burglar. Both had ended up on the scrap heap following Ollie’s owners’ decision to install Avocet’s snap secure ABS locks on their home, and spent the six weeks of the campaign trying out a variety of new hobbies – all of which tied in with events, movies or TV shows that were popular during the campaign period. The success of the #StayHomeSecure campaign wasn’t just limited to social media stats and engagement. Avocet saw a huge increase in the number of trade customers using its online store, bringing record months for both October and November. On top of that, a number of new locksmiths have already been confirmed as Avocet ABS stockists, and many more are on the verge of following suit. For further information about Avocet and ABS visit www.avocet-hardware.co.uk or call 01484 711 700. And make sure you don’t miss out on the festive Avocet fun by following @avocetabs on Twitter or liking its Facebook page .